Waiting on Wednesday is hosted by Jill from Breaking the Spine. "Violet Willoughby doesn't believe in ghosts. But they believe in her. After spending years participating in her mother's elaborate ruse as a fraudulent medium, Violet is about as skeptical as they come in all matters supernatural. Now that she is being visited by a very persistent ghost, one who suffered a violent death, Violet can no longer ignore her unique ability. She must figure out what this ghost is trying to communicate, and quickly because the killer is still on the loose. Afraid of ruining her chance to escape her mother's scheming through an advantageous marriage, Violet must keep her ability secret. The only person who can help her is Colin, a friend she's known since childhood, and whom she has grown to love. He understands the true Violet, but helping her on this path means they might never be together. Can Violet find a way to help this ghost without ruining her own chance at a future free of lies?" 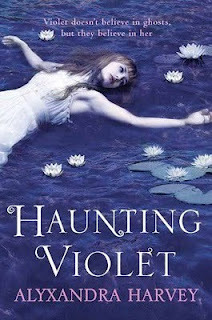 As soon as I saw the cover and read Violet doesn't believe in ghosts, but they believe in her I knew I was going to have issues with waiting all the way until June to get my hands on this one. I mean really, how awesome does this sound! Violet, a girl who can see ghosts has to help uncover the murderer before he strikes again, all while being in love with her best friend Colin and living with a crazy mother. Amazing! Oh and the cover is flipping perfect, very haunting yet beautiful just the same. I agree; that IS a catching line! How interesting. I'll be waiting for this one too :D Thanks for the heads up! Oh, I want to read this too!! !